← Stats Tip #1: Plot The Data! Wednesday, June 8, 2011 was World IPv6 Day. The event was an opportunity for participating content-network operators to test their IPv6 readiness, as well as to increase general community awareness of IPv6, and of the slowly ongoing transition. Another goal of IPv6 Day is to “shift the baseline”, as heise did last year: once network operators and content providers see that IPv6 doesn’t break everything (or, more realistically, fix those minor things which do break), they’ll leave it on, and the post-June 8 world will have a little more IPv6 in it. Indeed, scattered evidence suggests that this may be the case for some large content providers; a post to the NANOG mailing list indicated Microsoft’s XBox portal, for one, would still be v6 on the 9th. However, the CSG does research in network measurement, not in reading mailing lists and press releases, so we decided to go to the data. We have taken an informal look at data collected from the border of SWITCH, the Swiss national research and education network, which acts as an access network for Swiss universities and research laboratories. SWITCH has been a leader in IPv6 transition, running a dual-stack backbone in production for the past seven years. We had a quick look at three days of flow data from the SWITCH border, Tuesday (the day before), Wednesday (the day of), and Thursday (the day after), and found some indication that the event had its intended effect. First, a look at the time series: this shows data rates for all IPv6 traffic (light blue) and IPv6 web traffic (dark blue) across the border in Mbps, per five-minute bin. Here we see the customary daily seasonality, even more pronounced for web traffic, as this is more likely to be human-generated. 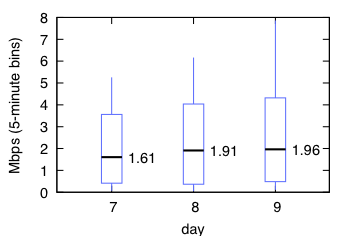 Traffic is indeed elevated on Wednesday, and appears to remain so on Thursday. Here we see quartiles for 5-minutes bins, but measure the IPv6 web traffic as a proportion of all web traffic seen in the same 5-minute bin. Here we see an even more pronounced peak on June 8 (the median bin had .88% of all Web traffic over IPv6, and the peak bin 1.7%) followed by a pronounced fall-off on the 9th. 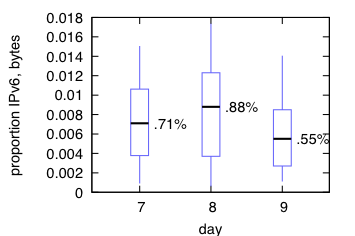 So, from the data set we looked at, we can’t make a conclusive statement on the “stickiness” of IPv6 day. What is clear, though, is that we have a long way to go: one notes that a median rate of 1.96 Mbps for an entire national research network, and a IPv6 traffic proportion of less than one percent, is relatively low volume. The transition will (slowly) continue.